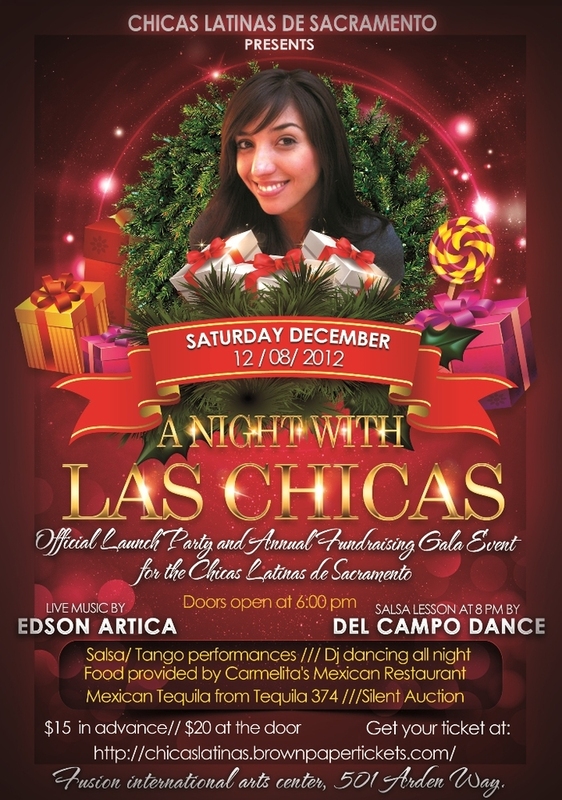 Chicas Latinas de Sacramento’s Official Launch and Fundraising Gala will be held on December 8, 2012, featuring live Latin music, dance performances, and lessons. SACRAMENTO, CA – Chicas Latinas de Sacramento will be formally launching their nonprofit organization with an evening of Latin festivities, including live music by Edson Artica, cultural dance performances by Samba de Terra and Salsa Riquisima, salsa lessons by Del Campo Dance Studio, Mexican cuisines and beverages, and a night of dancing! Festivities will be held at the Fusion International Arts Center, on December 8, 2012 beginning at 6 p.m.
Chicas Latinas de Sacramento, founded in 2009 as a social group, is a cultural organization which focuses on encouraging Latinas to volunteer and be in the involved in the Sacramento Community. They have worked regularly in the community providing assistance to numerous organizations such as WEAVE Inc., SAEHC, Sacramento Crisis Nursery Center, Rebuilding Together Sacramento, Festival de la Familia, and more! With over 150 members, and nearly four years of service, they now have a mission “to make a positive impact in both the Latin and Sacramento community by improving, connecting and embracing our culture and the community in which we call our home.” They are in the process of becoming a 501 (c) 3 nonprofit organization to provide more assistance and create positive cultural programs in the community. Admission is $15 in advance and $20 at the door. Attendees are encouraged to dress to impress. Advance tickets can be purchased at http://chicaslatinas.brownpapertickets.com. The Fusion International Arts Center is located at 501 Arden Way, Sacramento, Ca. 95815. For more information about the Fusion International Arts Center, visit www.fusionaic.com. For more information and interviews please contact: Angela Rosas at (916) 752-8199 or Angela@Angelarunsamuck.com.